Recently there has been a flurry of small form factor laptops making their way to market. Is the humble netbook making a comeback? The One Mix 2S is the latest offering from One Netbook, but has it got what it takes to replace your laptop and let the netbook rise from the ashes? Read on to find out more about the One Mix 2S, and at the end of this review, we’re giving our test model away to one lucky reader. You may recall a period where companies like Acer and Asus brought the netbook to the world. You may also recall that they had both a brilliant form factor and a rather short shelf life. This came down mainly to how underpowered and awfully slow they were, as well as the advent of the iPad. Netbooks were typically optimized for low weight and low cost, and as such omitted features like optical drives. By the end of 2012, many companies stopped producing them, and they’ve been replaced by devices such as the Chromebook. Chromebook’s however, run the slimmed down Chrome OS. This means you can’t use applications that are designed for full-fledged Windows 10. Over the last few years, this is where the 7″ netbook space has really come to life. 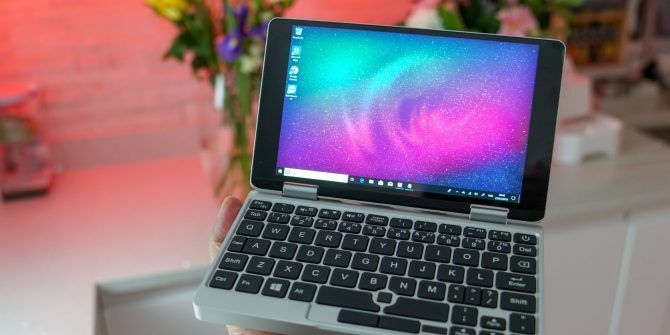 Hopefully, this second coming of the netbook is here to stay ,as many people prefer the form factor but aren’t willing to compromise on the spec or the OS. The One Mix 2S is the second iteration of this product, and it was released around six months after its predecessor. This might seem quite rather soon, but there are a few improvements that make this version a little more special. The One Mix 2S looks like someone took a shrink ray to a MacBook. This isn’t a bad thing in the slightest. Its chassis is CNC’d aluminum, and the keys are recessed perfectly to ensure they don’t leave ugly marks on the screen. Build quality is also fantastic, with the 2S feeling premium and well built. The hinges are another indication of the excellent build quality. They’re stiff enough to keep the screen at the same angle when using the touch screen, but not so tough as to make opening and closing feel like a workout. The back features a fan vent, with a speaker grill and rubber feet on the bottom. The port selection on the 2S is nothing short of exceptional. There’s a combination headphone jack, microSD card slot, mini HDMI and USB 3.0 Type-A. There is also a USB Type-C port which is where the One Mix 2S gets its juice, as well as being able to connect a dongle if you’d like to add more ports. This USB-C Hub Does Everything: QacQoc GN30H Review This USB-C Hub Does Everything: QacQoc GN30H Review The QacQoc GN30H is a USB-C hub like no other. Not only does it provide USB Type-A and Type-C ports, but also HDMI, device charging, Ethernet, and an SD card reader. Read More I can’t fault the design or the port selection on the 2S. Full marks! Form factor is obviously a focus here, and many will find the size of the 2S appealing. It can fit easily in a back pocket or a handbag if that’s your thing. The One Mix also has a yoga hinge, meaning it can transform from a laptop to a tablet in a matter of seconds. One of the things that they removed from the first iteration is the backlit keyboard. It would have been better if they kept this in, but considering the upgrades, it’s a worthy trade-off. The One Mix 2S is not just a pretty face. Spec wise it packs quite a punch for its size. Even compared to the 12″ MacBook which is near double in price! The 2S features an 8th Gen Core M processor which tops out at 3.4 GHz. There’s 8GB of DDR3 RAM and a blisteringly fast 256GB PCI Express (PCIe) SSD. The PCIe SSD What Is a PCIe SSD and Is It Better Than a SATA Data Drive? What Is a PCIe SSD and Is It Better Than a SATA Data Drive? PCIe SSDs are faster than SATA SSDs. But you may not need one. This article explains how PCIe SSDs differ from SATA SSDs. Read More is one of the major upgrades from the previous generation. It is very important because boot up times and even just general usage are an absolute breeze for the 2S. This might sound like something mediocre, but for someone as impatient as I am, the One Mix 2S definitely has it where it counts. Machines that have even slightly delayed loading times are extremely frustrating, and there was no sign of that on the 2S. The 7″ IPS display is pleasantly bright and sharp and has great viewing angles. Because the display is so small, you need to set the scale to at least 125% so you can comfortably see all the text on screen. Also, remember to turn on tablet mode in Windows if you’re turning the 2S into a tablet. Another item that is lightning fast is the fingerprint sensor. It makes a huge difference to the experience that the One Mix 2S provides and in this day and age should be on every laptop! The capacitive touch screen is responsive and accurate, but the glass does feel like it has a little too much resistance. Having a touch screen on a laptop is actually very intuitive. In fact, after moving to another laptop I found that I missed having one. As mentioned the hinge is very well built so while in laptop mode the screen’s angle doesn’t shift if you touch the screen. One Netbook also offers an optional stylus which does have different pressure levels. The stylus makes note taking on the 2S a cinch. If you’re an occasional Bob Ross, there are a few painting apps available as well. The stylus does badly scratch the screen, however, so I highly recommend getting the optional screen protector if you’re planning on getting the stylus. This is one of the issues with the 2S which takes us neatly into the next section. The One Mix 2S has got a lot going for it but there are a few issues. First and foremost, the fans can get very loud, very quickly. This is always the case for small fans and there is a workaround. Pressing the keyboard backlight key, which is an artifact from the previous model, slows down the fans. This will limit the CPU speed, but under normal workloads, you shouldn’t notice any difference. The trackpoint touch based mouse is usable but it’s not great. If you need to scroll across the screen you need to pick your finger up and swipe a few times. The 2S also lacks a scroll button which can sometimes get a little annoying. A regular rubber trackpoint would’ve been perfect in this position. The Wi-Fi, unfortunately, isn’t great. Both in terms of signal strength and throughput. Running a speed test on the 2S against any other machine illustrates how much room for improvement there is. Hopefully this is a simple software fix and not because the Wi-Fi antennae are of lesser quality. The worst part of about this device though is the keyboard. Things like TAB being next to the number one, backspace being next to the letter P and the period and comma keys being half width makes the learning curve quite steep for this keyboard. I found myself making lots of errors and having to look down at the keyboard frequently. This isn’t indicative of the quality of the keyboard which is fantastic. It’s always good to validate when a product can be used as opposed to a hypothetical scenario. Fortunately, I had the opportunity to put the One Mix 2S to the test on site. During a relatively large Ubiquiti install What is Ubiquiti UniFi, and How Can It Fix Your Wi-Fi Woes? What is Ubiquiti UniFi, and How Can It Fix Your Wi-Fi Woes? Nearly everyone has experienced limited Wi-Fi functionality and poor coverage, especially in crowded areas. An Ubiquiti UniFi network could be the solution. Here's what you need to know. Read More , I had to work in the network cabinet on a ladder. The form factor as well as having full Windows 10 on the One Mix 2S made this so much easier as opposed to having to carry a laptop everytime I had to move up and down the ladder. I’m sure many system administrators might appreciate this. If you type a lot, however, the keyboard does not make for a compelling choice. Especially if you’re using this as a secondary machine, as you’d get used to one keyboard and have difficulty switching. If you’re planning on making this your daily driver I would suggest having a monitor, mouse, and keyboard to which your One Mix 2S connects. It’s well built, quick, and is packed with features. Features that machines in a much higher price bracket just don’t include. Hopefully, the Wi-Fi issues can be fixed and there’ll be a better keyboard layout they can improve on. For now, I’ve got my eyes on what One Netbook is bringing in the future! Use the coupon code makeuse6 to get grab the One Mix 2S for $659.99 with coupon code HJWLZZPB, or enter our giveaway below to win one! Explore more about: MakeUseOf Giveaway, Netbook, Windows Tablet. id love to have one.. I'm very impressed id love to have this.. It's great to see a good idea make a strong comeback. Also nice to see that there has been no skimping on things like RAM and storage. I now have a new item on my "want at all costs" list. Looks like I could do so many things with this new computer...mine is so old and ineffective.